Aside from stress causing you to gain belly fat, your diet and nutrition plays a critical role in determining whether you lose weight or gain weight. What you eat, when you eat, how often you eat, and how much you eat largely determines whether you gain weight, lose weight, or maintain your current weight. If you eat more calories than you burn, naturally, you will gain weight - the extra calories has go somewhere. The extra calories become long stores of energy in the form of body fat. The opposite is true If you eat less calories than you burn. 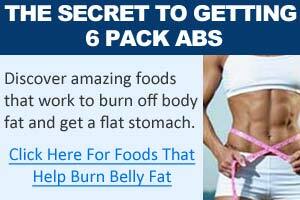 However, it's generally easier to gain fat than to lose fat, and it's especially difficult to reduce belly fat. To reduce belly fat, you need to tap into long term stores of energy - body fat, and the only way to do this is with a calorie deficit. When you lose weight, body fat is not the only thing that is lost. Other sources of energy such as carbohydrates and proteins are also burned as energy during your weight loss. During this process, you can also end up losing some lean muscle mass as well, which is the least desirable effect of a weight loss program. Unlike body fat, your muscles expend energy, thus help you burn off calories. As you lose muscles, your metabolic rate also decreases making weight loss more difficult. Because each pound of fat contains roughly 3,500 calories, there's a general saying that to lose one pound of fat a week, you need to create a calorie deficit of 3,500 each week, which equals a calorie deficit of 500 per day. But this is only a very general rule of thumb. Eat foods that "burn fat"
Most of these points are pretty simple and straight forward, and don't need to be explained in detail. But I would like to expand a bit on the last point - drinking more water. You may wonder what does water have to do with losing fat? Your kidneys requires water, and lots of water to function properly - most people do not drink enough water. When your kidney does not get enough water, it does not operate at optimal levels, and your liver ends up assisting the kidneys - so the liver has do perform its own functions, along with helping the water deprived kidneys. This is significant because a key function of your liver is to metabolize fat. When it has to pick up the slack from the kidneys, the liver is unable to metabolize fat efficiently. So if you're not drinking plenty of water - at least 8 glasses a day - then you need to start now. Not only does drinking extra water help you lose weight, it's also good for you, and helps improve your bodily functions. After all, 60% of your body is made up of water (55% for females). As you can see, simply drinking an extra 500ml of water before each meal increased their weight loss by 2kg. If you're not getting enough water, start drinking more now. For example, for a 150lb person, the weight loss caloric intake range would be about 1500 to 1800 calories per day. A more precise way to determine how much calories you burn on a daily basis is to use a BMR / RMR calculator. There is no shortage of diets that are created to help you lose weight and burn fat; however, as many will eventually discover, it gets more and more difficult to lose weight as your weight loss progress. The key reason why many diets fail, or begin to fail after some initial progress is because of your body's natural tendency to maintain homeostasis. "Human homeostasis refers to the body's ability to regulate physiologically its inner environment to ensure its stability in response to fluctuations in the outside environment". As you reduce your calorie intake, and begin to lose weight, to maintain homeostasis, your body naturally adjusts its metabolism downwards to match your new level of calorie consumption, making it more difficult to lose weight. The calorie shifting diet plan is about cycling your daily calorie intake to confuse your metabolism and keep it working at a higher level. With traditional diets, a calorie deficit is created, and this calorie deficit is kept roughly the same day after day; however, our bodies are very adaptive and when it notices that it is getting less calories, it quickly adjusts metabolism downwards to conserve energy and match your energy output with the new calorie intake. This is why it become difficult to continue your weight loss after some initial success, and this is one of the main reasons why so many people fail at diets. The major difference between calorie shifting and other diets is that calorie shifting is really just a theory - an idea - and no really a diet itself. The calorie shifting theory can be applied to any number of different diets with the key principle being a constant change in daily calorie intake. In essence, you will have days where you consume more calories than your maintenance level, and days where you have a calorie deficit. 14,700 - 3,500 = 11,200 calories per week. Divide this by seven days, and you get 1600 calories per day. So with a traditional diet, your goal would be to consume roughly 1600 calories per day. However, if you were to consume 1600 calorie per day on a consistent basis, you body will quickly pickup on this, and lower its metabolism to match the reduced calorie intake. To avoid this, the calorie shifting theory has been effectively used by many people to maintain a higher metabolism during their weight loss. With this calorie shifting plan, you consume the same amount of 11,200 calories per week creating a deficit of 3,500 calories. The major difference here is that there are days where you consume low calories, and there are days where you consume higher amount of calories. The Fat Loss for Idiots diet is a popular diet plan based on shifting calories to increase your metabolism. The next part will cover exercises to burn burn belly fat.